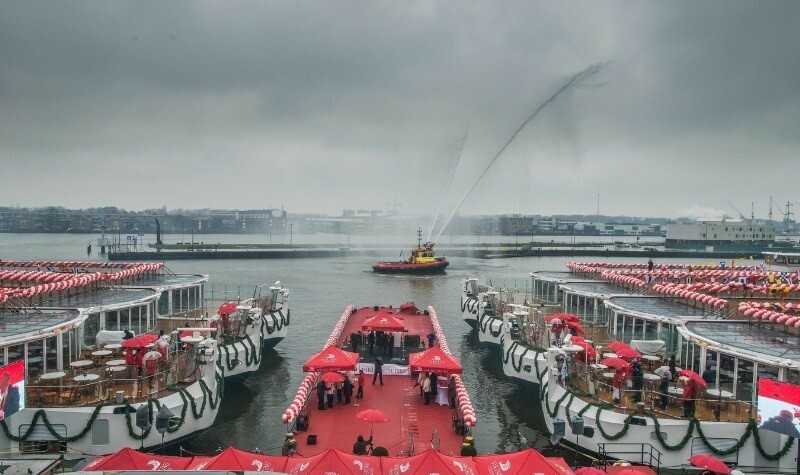 Yesterday Viking River Cruises welcomed the latest additions to its fleet with the christening of six new Viking Longships during a waterfront celebration in Amsterdam. Recognizing the contribution the travel trade has made to the growth of the river cruise industry, Viking honored six of its key partners by naming them as ceremonial godmothers for the six new ships. The new additions to the river fleet are Viking Rolf, Viking Kadlin, Viking Alruna, Viking Alruna, Viking Vilhjalm and Viking Tialfi. This christening event marks another year of impressive expansion for Viking, occurring just two years after the company set a second GUINNESS WORLD RECORD for the most new ships launched in a single day, and just one month before Viking Ocean Cruises launches its second ship, Viking Sea. Of the six new Longships, four will be deployed on Viking’s most popular itineraries on the Rhine, Main and Danube Rivers; the remaining two will sail the Seine River on Viking’s Paris and the Heart of Normandy itinerary. Later this month, Viking will also debut a seventh new river ship for 2016, Viking Osfrid, which is inspired by the Longships design and specifically built for the Douro River, bringing the company’s total number of ships in Portugal to three. The prominent women who will serve as Viking Longship godmothers represent travel trade organizations from across North America and the United Kingdom. Viking Longships integrate a patented corridor design and cutting-edge technology with comfortable amenities that reflect guest preferences and current travel trends.